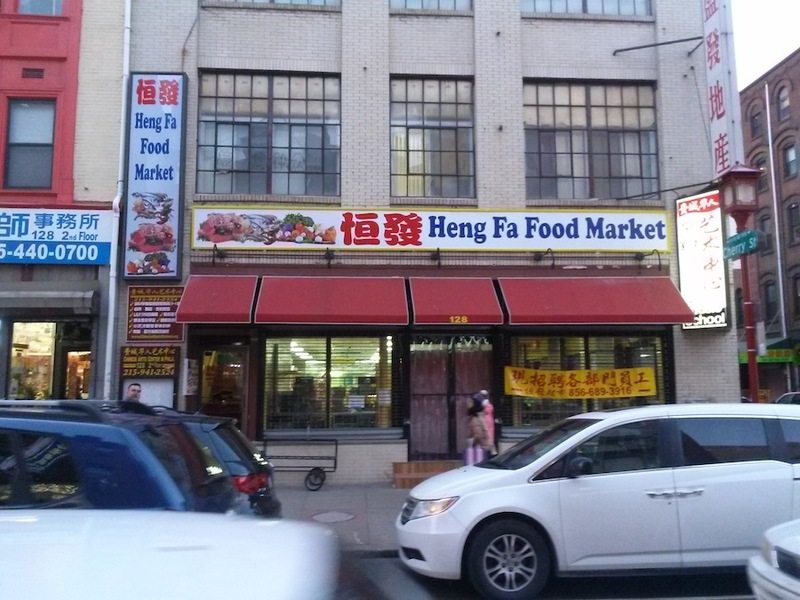 If you haven’t been to Chinatown in a few weeks, Heng Fa market has opened at a new location. This is the market that had purple signs “King Market” that was previously split across 10th St. just north of this location, beside the fire station with the produce section, and across the street from there for fish and seafood. Now the market is the basement and first floors of the corner of Cherry and 10th. The basement is drinks, dried, and non-perishable foods, and the first floor is produce, meats, and seafood. This is definitely one of the better markets of Chinatown, with an good selection of all basics. The market is also pretty clean and brightly lit. The only downside is there is little space for a lot of people. If you go there after work, it will likely be packed. If you ever went to their old produce store near the fire station, that place too needed to be carefully navigated to get through the queue waiting to pay in order to see the fresh produce. These days it is cold enough that they are showcasing frozen fish and dumplings outside the store. Nice produce, and nice fish and seafood. Check it out! This entry was posted in - Featured Food Discoveries, Chinese food. Bookmark the permalink. We went to Chinatown yesterday. First, I freaked when I saw King Market shuttered. Then I crossed the street and freaked again until a Chinese lady pointed me toward the new store. The fish area is just as good and comprehensive as it was, and we bought some scallops in the shell. I had awful trouble finding ya cai, so I settled for some zha cai (not the same, but I wanted to feel successful in my quest, so I got “something” cai.) The butcher department is new, and everything looked good and fresh. They had black chickens in the cooler. (Crap, I meant to buy tripe!) The produce dept seems very comprehensive, but I didn’t need anything. Crowded ain’t the word for this place. Shoving, bustling about and definitely hopping. I love your blog. Hi Addy T, I thought I saw a few varieties of ya cai last time I was there, at the end of the open seafood freezer isle, just across from the fish. It wasn’t in the small foil packs, but it seemed to be varieties of yibin yacai. Thanks for visiting the blog, and hope your “something” cai worked out well for what you were planning to cook! While I’m thinking of it, is there anywhere within 100 miles of Philly that we could get chatang (gruel, sorta?) with sweet osmanthus sauce? Our daughter was in Beijing for school, and a Chinese friend took her out for this treat and she said it was just magical. Hi Addy, I don’t know of any local restaurants that would do chatang. They do sell osmanthus flowers for cooking with in Chinatown though. You’re talking about the tea soup, right?